1. A species wise list of all the trees is required to be identified before applying for tree cutting permission on Transit Pass or Transit Permit. 2. Species wise number of the trees may be made with numericals. 3. 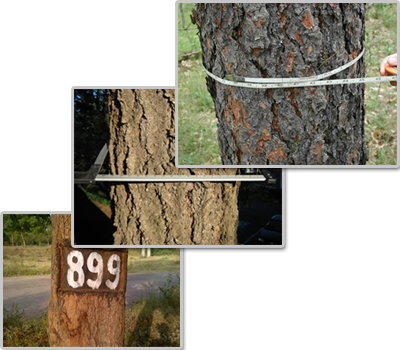 Marking of trees with its serial number need to be made at two points i.e. at breast height level which will be detached after felling and below 15 cm of stump height that is to be retained after tree felling. 4. The girth of the tree species is to be measured with a measuring tape at a breast height level putting the tape at uniform height all around. 5. The approximate height estimation may be made for each tree species wise. 6. A recording of girth and height may be taken up in meters for each tree and a list is to be prepared. 7. The list of trees species wise need to be felled and transported may be furnished with the application Form-III for necessary action by the authority. 8. The tree marking may be made by blazing the stump at the stump-height level and at the breast-height level.